Mary Manners is an award-winning romance writer who lives in the beautiful foothills of East Tennessee with her husband Tim and the cherished cats they’ve rescued from local animal shelters…Lucky and Gus. She loves swimming, running, flavored coffee and Smoky Mountain sunsets. Mary believes everyone has a story to tell, and she loves to share hers. She writes inspirational romances of all lengths, from short stories to novels—something for everyone. Learn more about Mary Manners at her website: www.MaryMannersRomance.com. 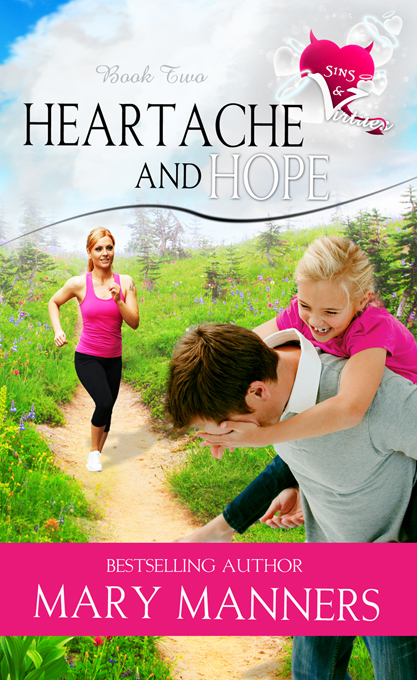 Mary’s here to tell us all about her new book, HEARTACHE AND HOPE. Patrick Litton is raising his six-year-old daughter Aubree alone. As the leader of Dash for the Dream, the widower works tirelessly to secure funding in search of better treatment for all those afflicted with CF, including Aubree. Patrick has no time for romance—until he meets Daylin at the Dash for the Dream kick-off party. Daylin and Patrick don’t expect to fall in love, but both learn that when it comes to romance, training for a marathon is the easiest part of their journey. It sounds like an awesome story, Mary. And the good news is that Mary has kindly offered to give away a copy of her book. So be sure to leave a comment and you might be the lucky winner! What an interesting story line. Best of luck with your book, Mary. Thank you for the opportunity to win a brand new book! This looks and sounds like such a lovely read. A great opportunity thank you. Thanks for the read,sound like it would be a good story. Barbara, you’re the winner! Mary will be in touch. Thanks so much for reading my blog. Sounds like an awesome book. Thanks for the giveaway and a chance to win.